Three Problem Elimination Essentials | Fulcrum ConsultingWorks Inc. If you want to improve efficiencies, eliminate unwanted turnover, or better serve your customers, eliminate problems. If your organization struggles to wipe problems out forever, consider these 3 essentials. 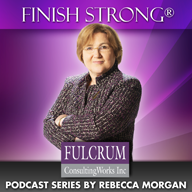 This entry was posted in Podcast Series: Finish Strong® by Becky. Bookmark the permalink.